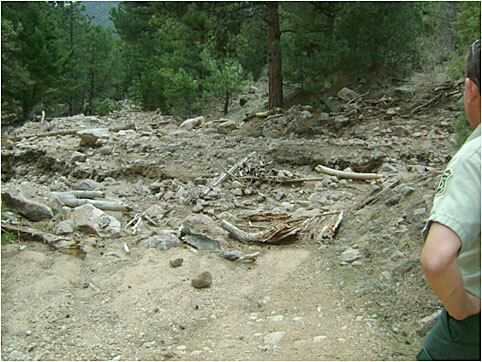 The Lefthand Canyon OHV 4WD road and trail network was seriously impacted by the September 2013 flood. The main entrance was destroyed as well as all roads in the lower parts of drainage's as well as sections of roads that had drainage's cross them. 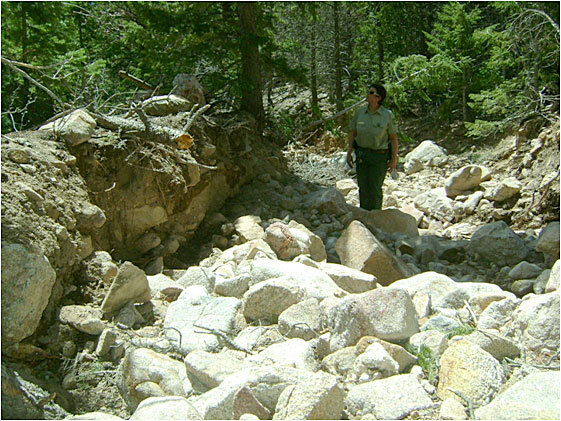 The Boulder Ranger District has reviewed the area on the ground several times to collect information on the impact. 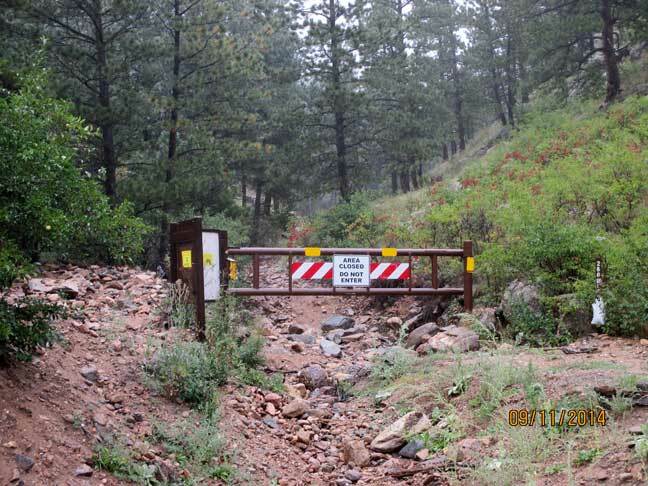 On July 5, 2014 the Trailridge Runners 4WD Club and the Boulder County Trail Riders members were escorted by the Boulder Ranger District on one of the reviews. 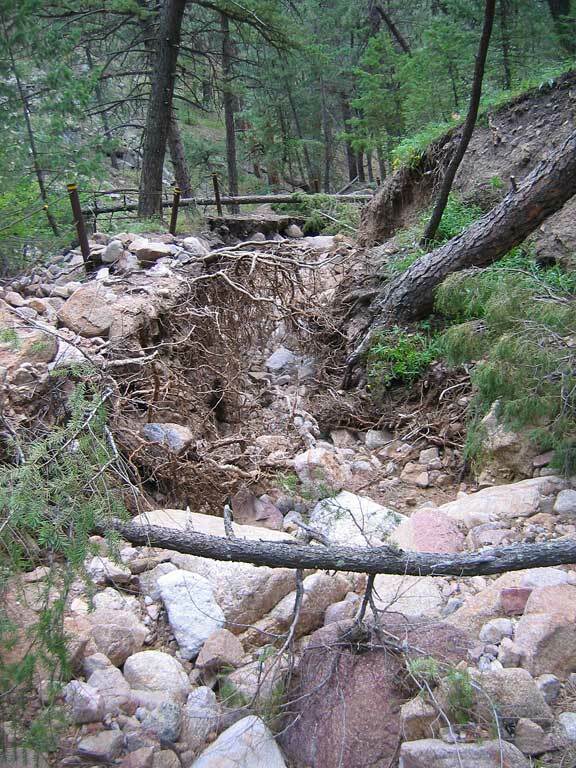 The main entrance to the Lefthand Canyon OHV area was destroyed by the flood waters. The metal kiosk and gate are still in place. 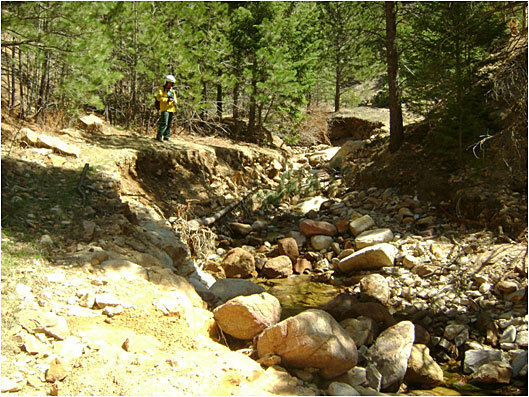 The section of 4WD road between County Rd 94 and the first hairpin turn has been scoured out and only small sections remain. This entrance would require a major amount of work to repair. The shooting area has been scoured out about 40 to 50 feet wide. 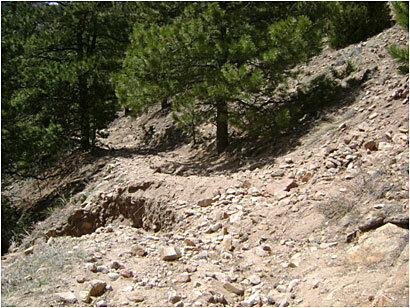 Above the entrance the Lefthand Main 4WD road has little impact up to 5 Points. 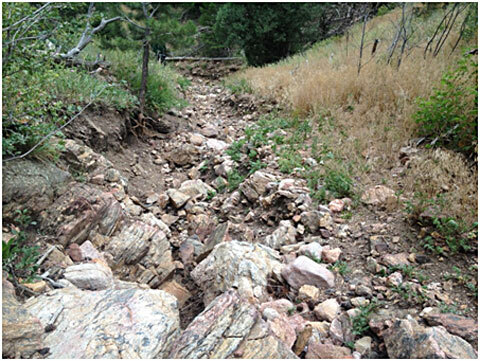 There is rutting on the switchbacks near the meadow restoration area and some sections of 4WD road that have had small debris flows cross them. 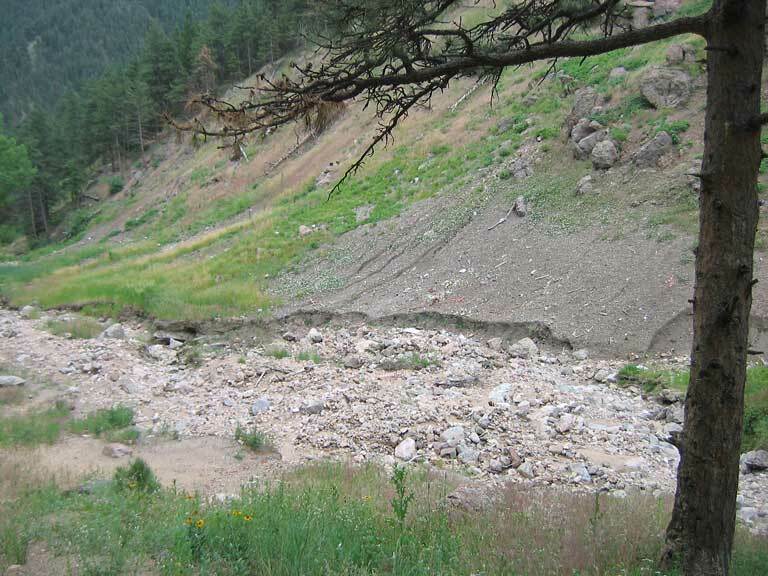 From 5 Points to Upper 5 Points there are a few debris flows around the old mine tailings above Squeeze Rock. 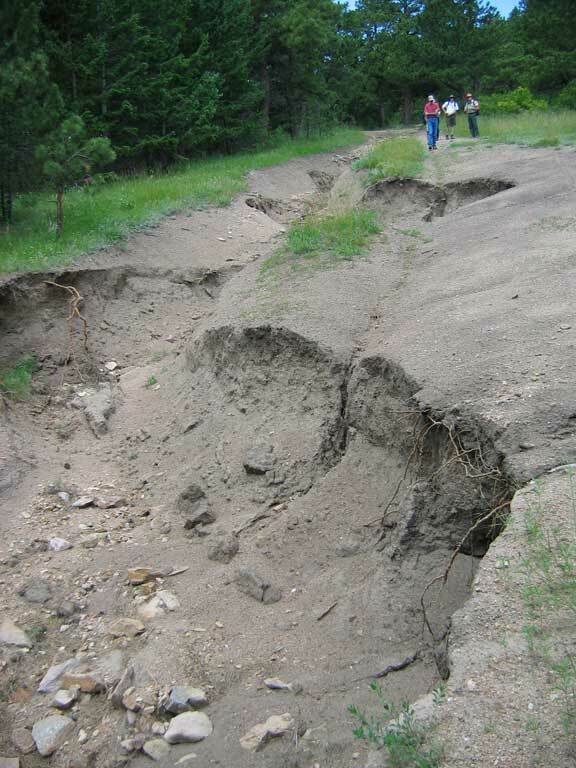 The ledge road past the mine tailings has a small section that needs some repair. 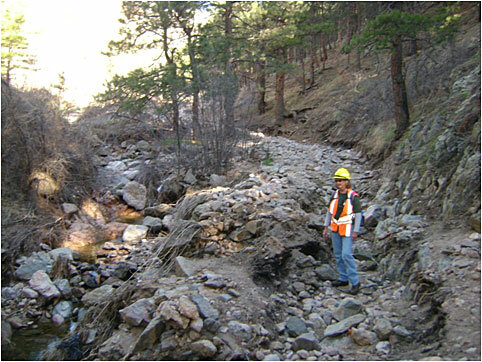 At a bend in the road before the final climb to Upper 5 Points a drainage cut the road at the curve and will need equipment to repair. It is unknown the extent of damage to Mother Hill. 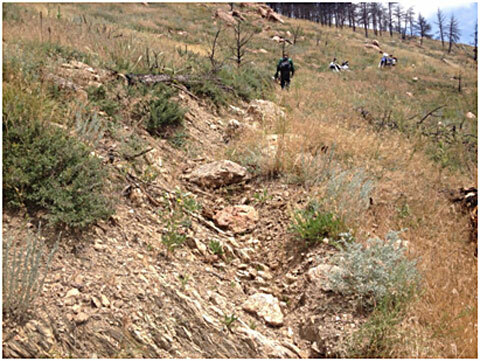 Most likely the upper section that is at the top of the ridge did not get impacted. The upper section of Fireman Hill had little to no damage. The water bars that were put in place are working. 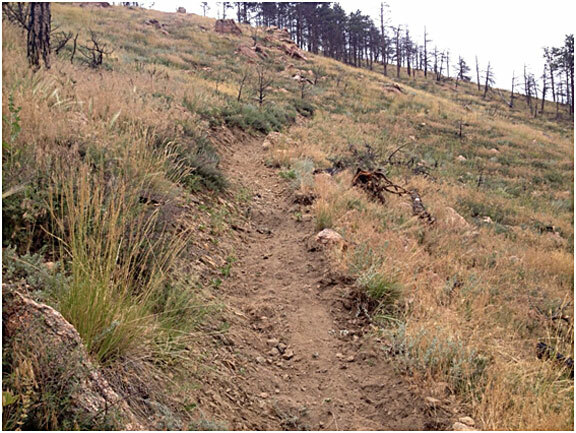 The switchbacks have seen some rutting at the lower sections and will need maintenance. 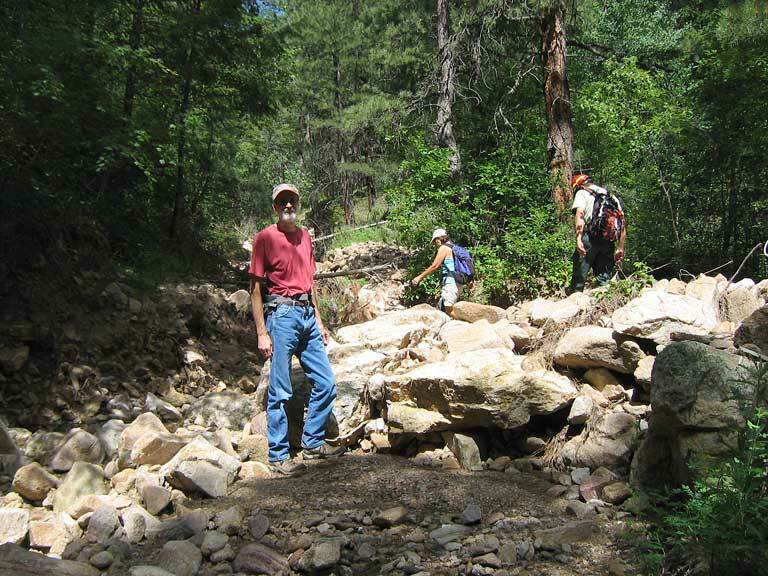 At the start of the road there was moderate impact from the flood with some scouring of the road. 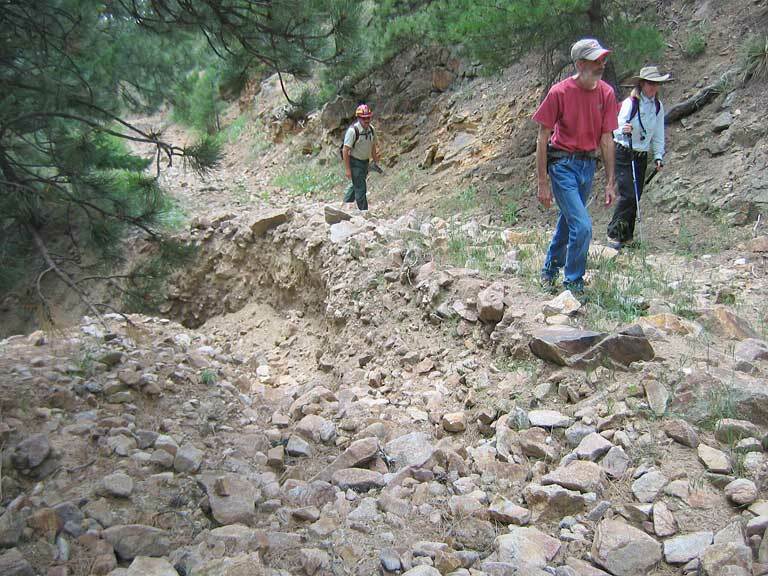 What remains of the road in the lower section is mainly missing the fine material fill. 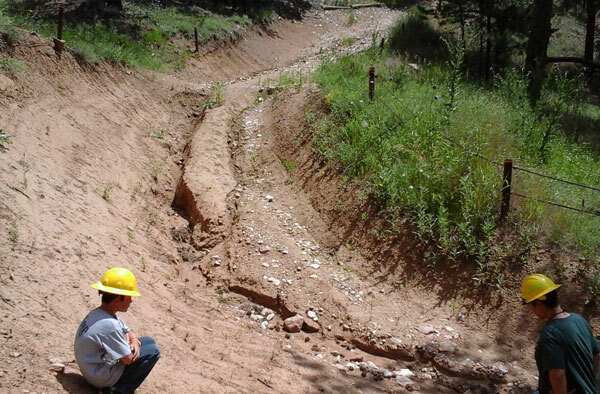 After twenty yards or so the canyon narrows and the flood damage becomes more pronounced. 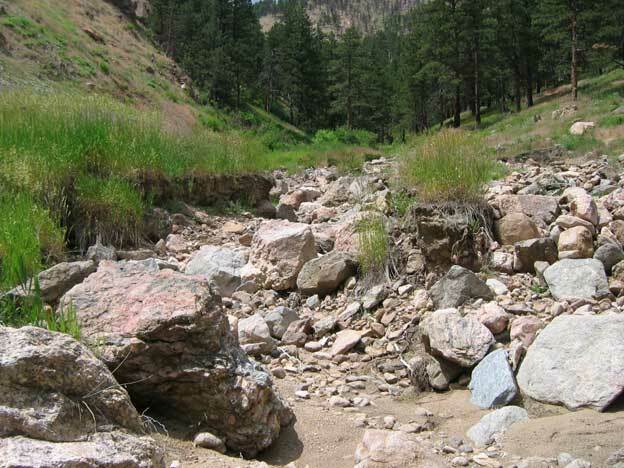 In some sections the water flowed down the drainage, in others it flowed down the road. 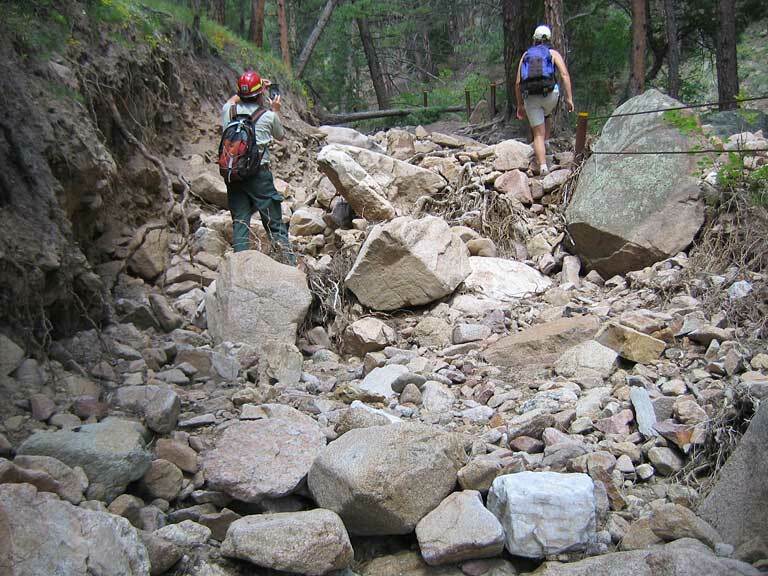 There were places that the road has been scoured out down to large boulders. 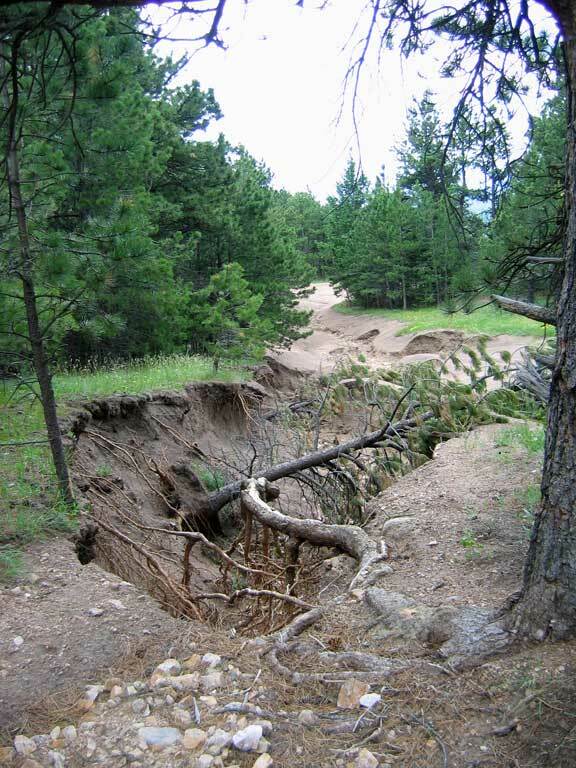 Sections of the road had been removed to four or five feet deep. 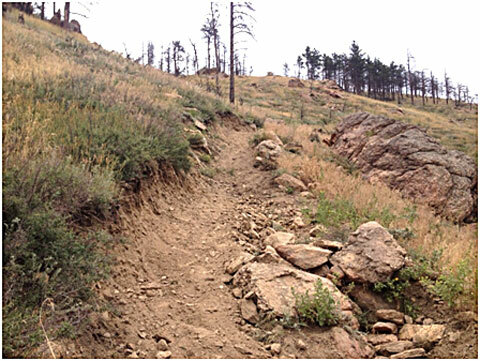 From the end of the gulch the switchbacks up to FR286 have very little damage. 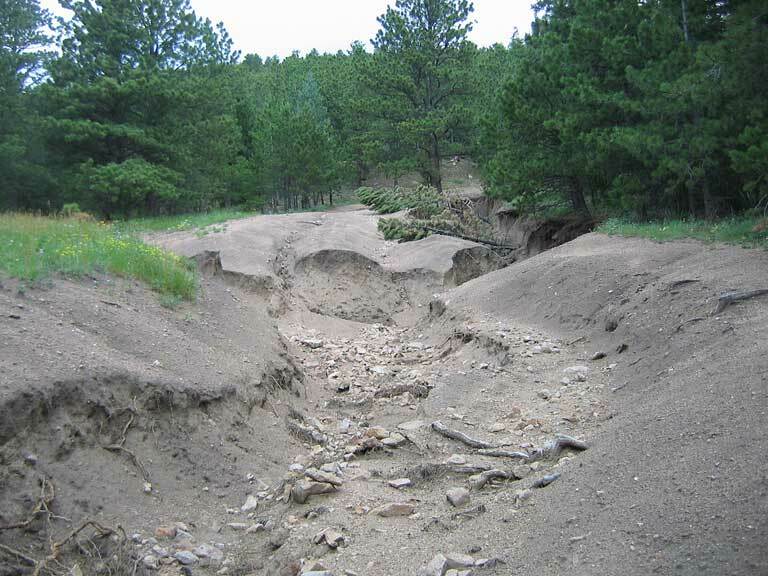 At Upper Five Points the decomposing granite that makes up the road to the west where FR288A and FR288B connect has been severely eroded. 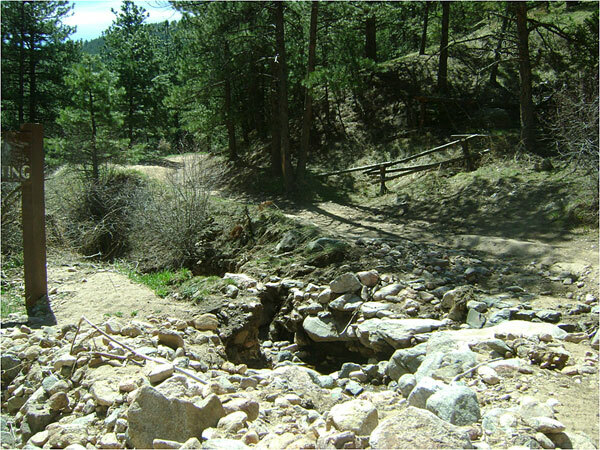 Castle Gulch was also heavily damaged by the flood. 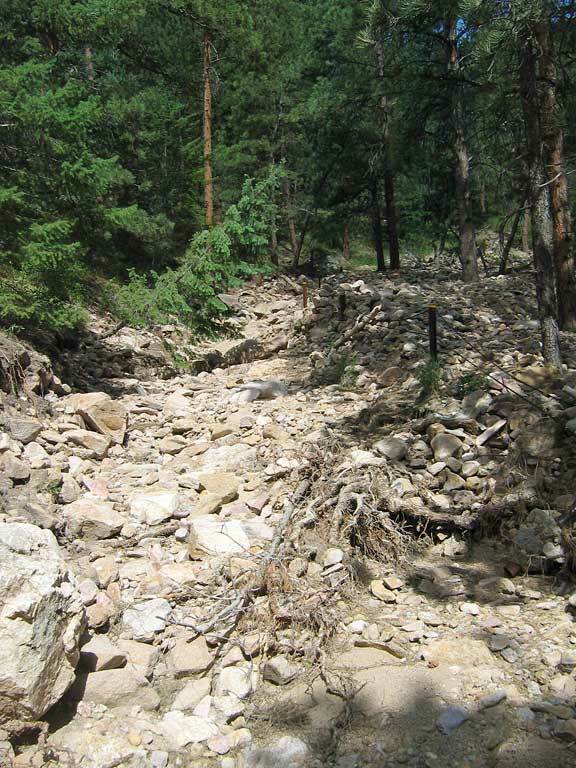 Most of the lower road sections near the creek have been destroyed. 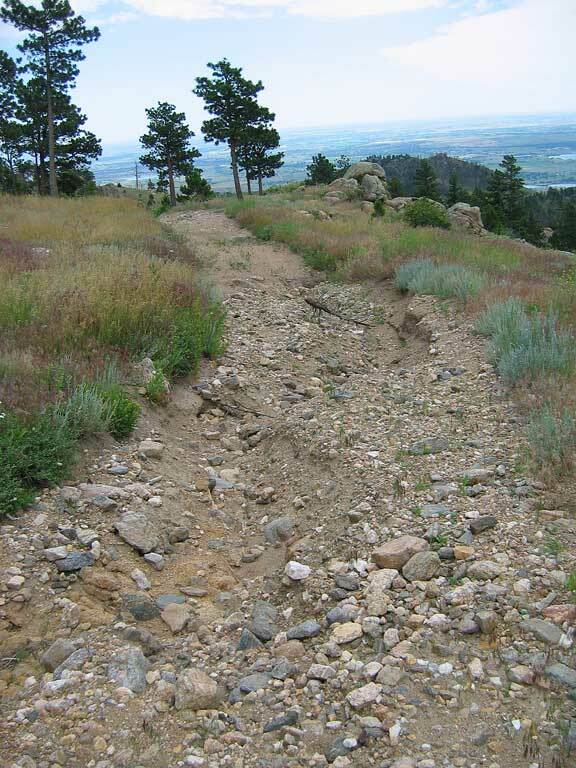 The Spruce Gulch Trail has been impacted and rutted from its starting point near the upper kiosk. 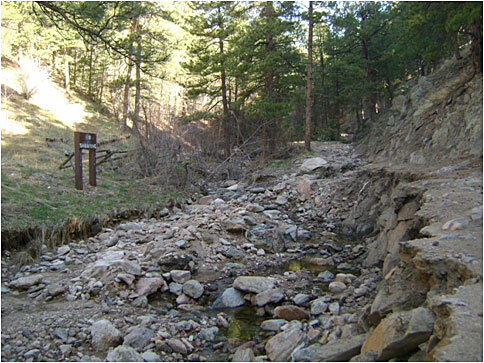 Cavanaugh's Trail lower section is damaged where it connects with Upper Carnage, FR286E. 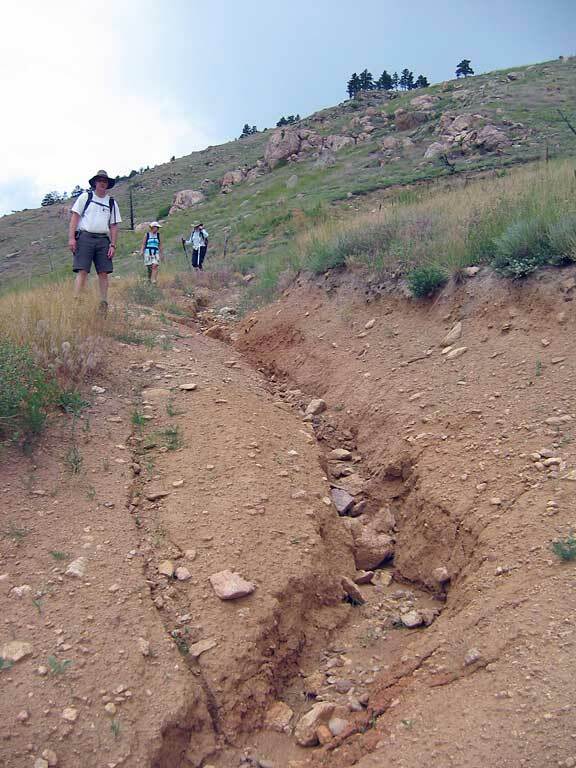 The Saddle Trail Loop was damaged. 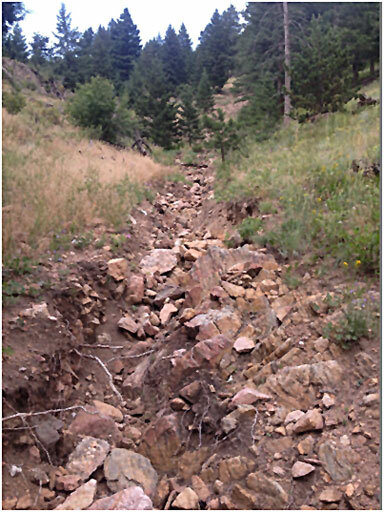 It has been repaired by the State Trails Trail Crew. Saddle Trail West to its connection with Saddle Trail Loop, FT840 and Saddle Trail East, FT842 was not impacted by the flood. Saddle Trail East is in good condition at the top. 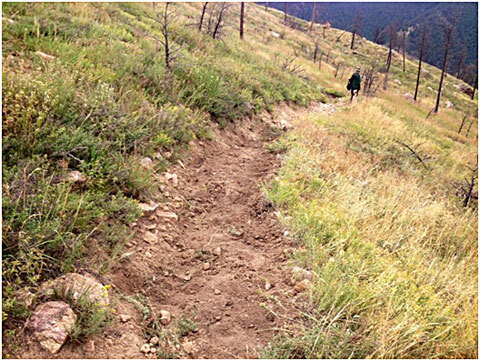 The lower sections of Saddle Trail East have some rutting up to a foot deep and will need to be repaired and better water bars installed.